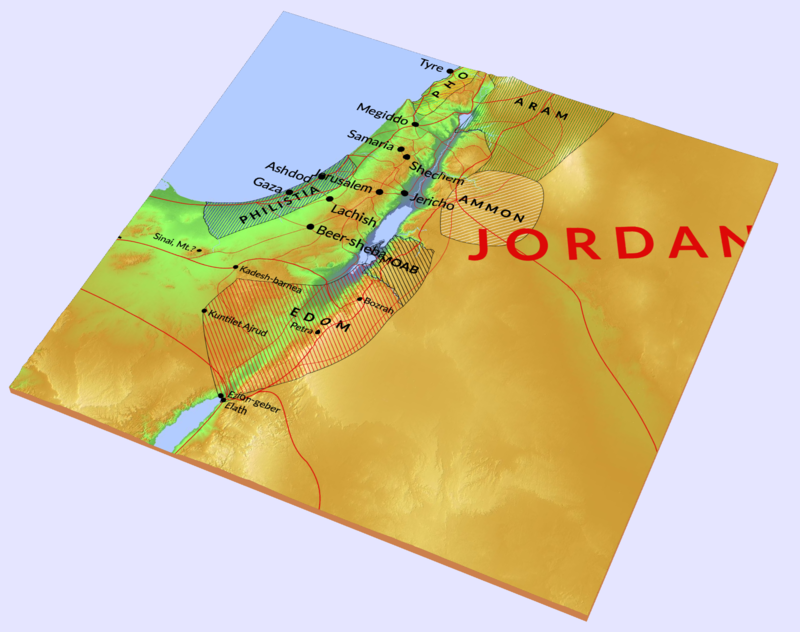 Israel is Real 2019.1: Jordan is Real Too! You are here: Home / Bible Lands / Israel is Real 2019.1: Jordan is Real Too! It was a great idea to post daily updates while I was in the land of the Bible. It just wasn’t a very realistic idea. The combination of jet lag, early morning wake up calls, and long, active days reversed the old maxim: we were “early to rise, early to bed.” I found I didn’t have time or energy for new posts. Apologies if you have been looking in vain for the promised updates. You can find daily posts by GRTS students here and at #grtsisrael. My plan now is a series of posts on the high points of the trip over the next several weeks. In my previous post I spoke in a general way that may have been misleading. The “land of the Bible” obviously encompasses more than the modern state of Israel. It reaches east to Babylon (modern Iraq), south to Egypt, west to Rome, and north to Syria and Turkey. At the heart of these Bible lands are today’s Israel, Palestine, and Jordan. Our trip actually started in Jordan, so we will begin with this remarkable country. Jordan is a constitutional monarchy which has been ruled by King Abdullah II since 1999. Archaeological discoveries dated to the paleolithic period indicate that Jordan has been inhabited for at least 20,000 years. The country was officially formed as an independent state in 1946 after a transitional period beginning with the Arab revolt against the Ottoman empire during World War I. It is about 1/8 the size of Texas, roughly equivalent to the size of the US state of Maine. The population is around 10,000,000, including many refugees from Palestine, Iraq, Lebanon, and Syria. About 4,000,000 Jordanians live in the capital city, Amman. Jordan has been a model of moderation and stability in a very turbulent region. About 95% of the population are Muslims, and 4% are Christians. 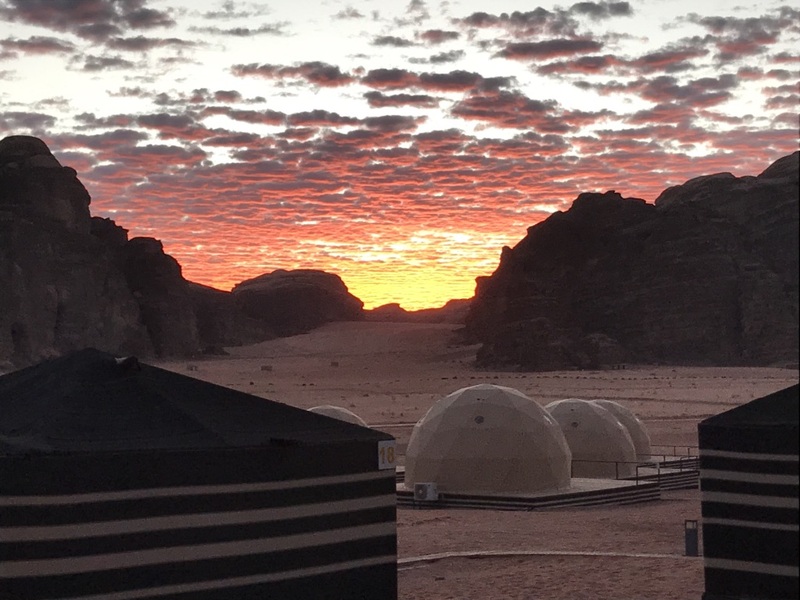 Jordan’s energy resources are small compared to its neighbor Saudi Arabia, leading to its growing solar and wind energy programs. Its main products are potash, phosphates, and pharmaceuticals. Tourism is also a major industry. The following stand out among the many significant biblical places and events in Jordan. Much of the Old Testament is tied to the Jordan, including the narratives of Abraham and Lot (Gen 13), Jacob and Esau (Gen 32:9-12), David and Absalom (2 Sam 19:17), and Elijah and Elisha (2 Kgs 5:10; 6:1-7. Of course, Israel’s exodus from Egypt led to a momentous and miraculous crossing of the Jordan into the promised land (Josh 1:2; 3-4), the land Moses could see (but not enter- Num 20:10-13)) as he looked out over the Jordan valley and beyond from Mt. 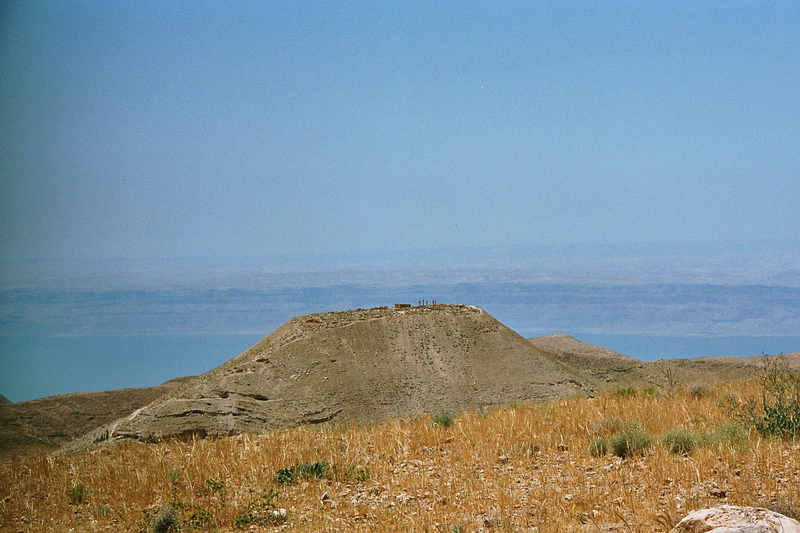 Nebo east of Jericho (Deut 34). After Israel conquered the land, the territory allotted to Manasseh included Gilead on the eastern side of the Jordan. Reuben and Gad’s lands were totally on the east side of the river. These tribes built an altar near the Jordan to link themselves to the Lord’s altar in the tabernacle, but the altar was misunderstood by the western tribes, nearly leading to civil war (Josh 22). In the New Testament, the ministry of John the Baptist was located in the Judean wilderness near the Jordan (Matt 3:5-6; Mark 1:5; Luke 3:3; John 1:28), and Jesus was baptized by John in those waters (Matt 3:13-17/Mark 1:9-11/Luke 3:21-22). Jesus would have crossed the Jordan several times during his ministry (John 3:26; 10:40). Peter’s crucial confession of Jesus’ identity occurred at or near the headwaters of the Jordan at Caesarea Philippi (Matt 16:13; Mark 8:27). 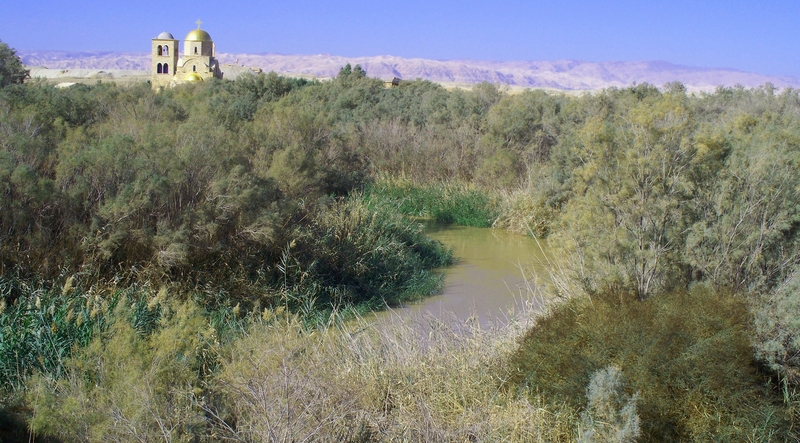 Those who visit Jordan and Israel today, not unlike Naaman of old (2 Kgs 5; Luke 4:27), are surprised that such an unimposing stream as the Jordan is so prominent in the Bible. As the Jordan flows south of the Sea of Galilee toward the Dead Sea, pollution is a major problem. Much water is diverted for domestic and agricultural purposes. Runoff from saline springs, agriculture, industry, and sewage plants flows into the river. Year by year a decreasing amount of increasingly polluted water enters the Dead Sea, which is rapidly shrinking. More on this in our next post. 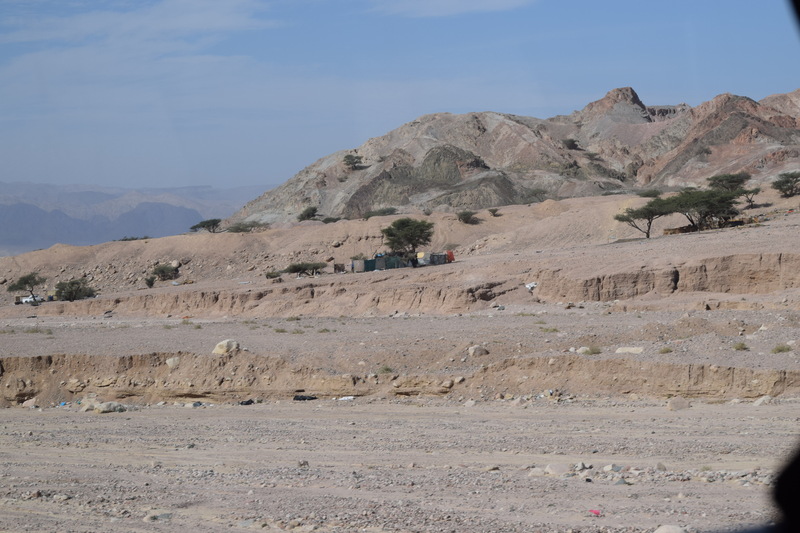 Israel’s exodus from Egypt and eventual route into the promised land led northeast through the Edom and Moab, passing through rugged, arid wilderness territory like that pictured here. Unlike Israel’s, our travel through this area was eased by a motor coach, 4×4 pickup trucks, and backpacks with built-in hydration bladders. 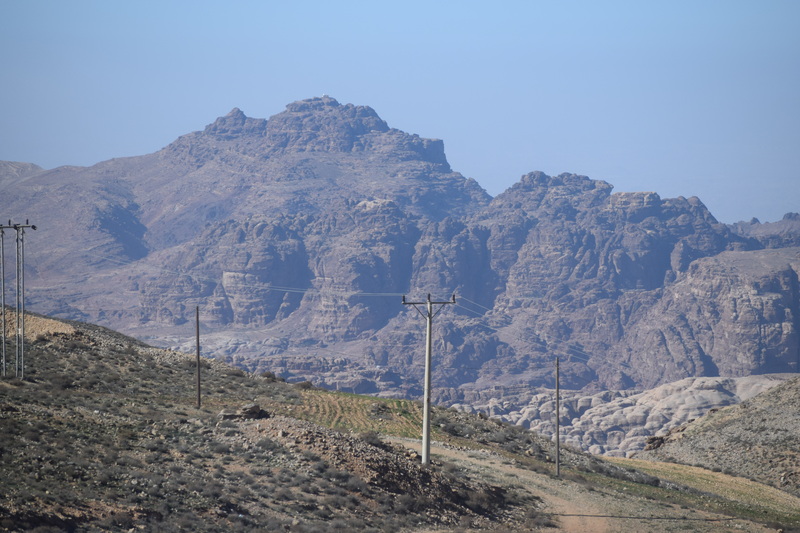 Jebel Nebi Harun near Petra, sometimes identified with biblcal Mt. Hor. Israel’s travels through Jordan is the background and setting of setting of the book of Deuteronomy, which contains Moses’ instructions to Israel as they prepare to enter the promised land (Deut 1:1-5). Conflict with and victory over Sihon, king of Heshbon (about 20 miles east of Jericho), and Og, king of Bashan (east of the Sea of Galilee) figure prominently in the narrative of Israel’s travel to Shittim, the point of departure across the Jordan into Canaan, the promised land (Josh 2:1; 3:1). 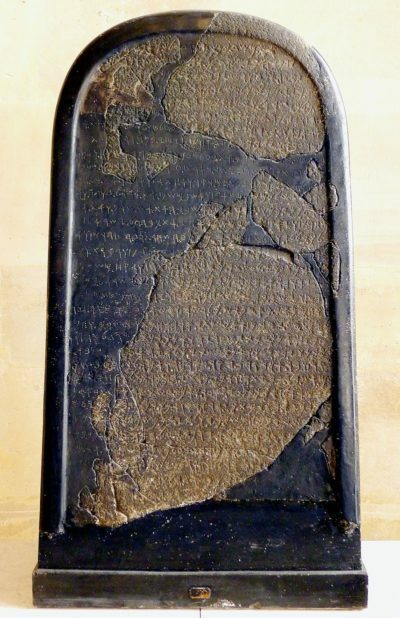 The Mesha Stele or Moabite Stone (discovered at Dibon in 1868, currently housed in the Louvre, Paris) is a remarkable complement to the biblical narrative of 2 Kings 3 concerning the revolt of Mesha, King of Moab, against Jehoram, King of Israel (2 Kgs 1:1), after the death of Ahab King of Israel. Jehoram enlisted Jehoshaphat King of Israel and the King of Edom to aid him in a campaign against Moab from the south through Edom (2 Kgs 3:8). A water shortage threatened the campaign, but Elisha the prophet brought water to the area (2 Kgs 3:9-20). As Elisha prophesied, Jehoram’s forces prevailed at first (2 Kgs 3:21-25). With defeat imminent, Mesha sacrificed his firstborn son on the wall of his city Kir Hareseth (near modern Al Karak). This deplorable and horrific act brought great wrath down upon Israel (2 Kgs 3:27), whether the Moabites’ wrath or God’s wrath through the Moabites is difficult to say), and Jehoram’s forces retired from the battle. The Moabite Stone is a shaped and inscribed chunk of basalt, about 42 inches high, 28 inches wide, and 14 inches deep. It is a royal victory stele celebrating Mesha’s victory over Israel and the power of the god Chemosh. As would be expected, it omits mention of the sacrifice of Mesha’s son. The inscription is quite valuable not only for biblical history but also for the study of the historical development of semitic languages. Andre Lemaire’s argument for a reference to the “house of David” in the stone has been disputed by other scholars. 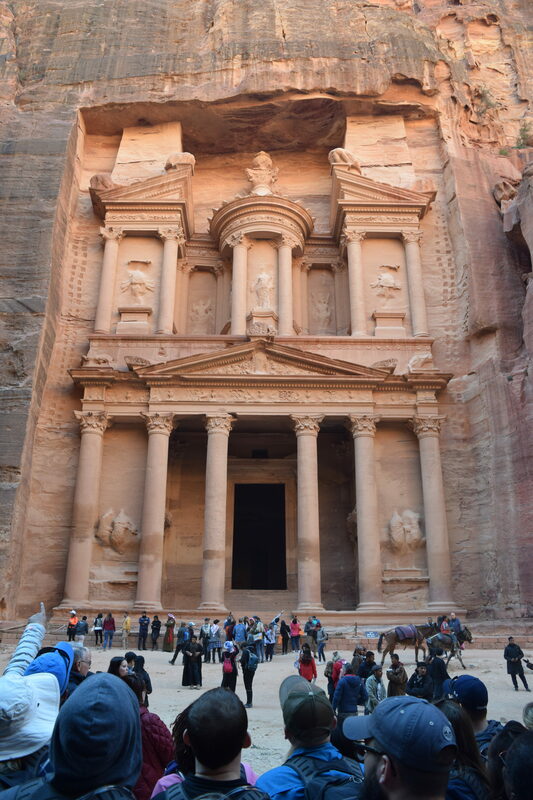 Although its origin and history are somewhat obscure, Petra is the most famous tourist site in Jordan today. Millions of people may not be aware that they have seen Petra—The Khazneh and the Siq (images below) are the setting for the final scene of the 1989 blockbuster Indiana Jones and the Last Crusade. Click here if you’d like to see Harrison Ford, Sean Connery, and their two sidekicks galloping away from the Khazneh through the Siq into the sunset (without the holy grail). Petra’s unique architecture features buildings carved into beautiful red sandstone cliffs, leading to it being known as “the rose city.” Al Khazneh, pictured above, is popularly known as the Treasury but was more likely the mausoleum of King Aretas IV. It is difficult to establish the origin of the city, but the Nabateans lived there from perhaps the fourth century BCE, flourishing from the first century BCE to the first century CE. Later Nabbatea was annexed to Rome and damaged by earthquakes. After centuries of obscurity, it was “discovered” by the Swiss traveler Johann Burckhardt in 1812. The Siq (“shaft”), a natural geological fault leading to Al Khazneh. Note the water channel carved into the left side. The Nabbateans’ knowledge of and ability to conserve scarce water resources led to their control of caravan trade routes through Edom and to great wealth and power for a time. Some believe Sela in the Old Testament (e.g. 2 Kgs 14:7; Jer 49:6) is a reference to Petra, but this is doubtful. 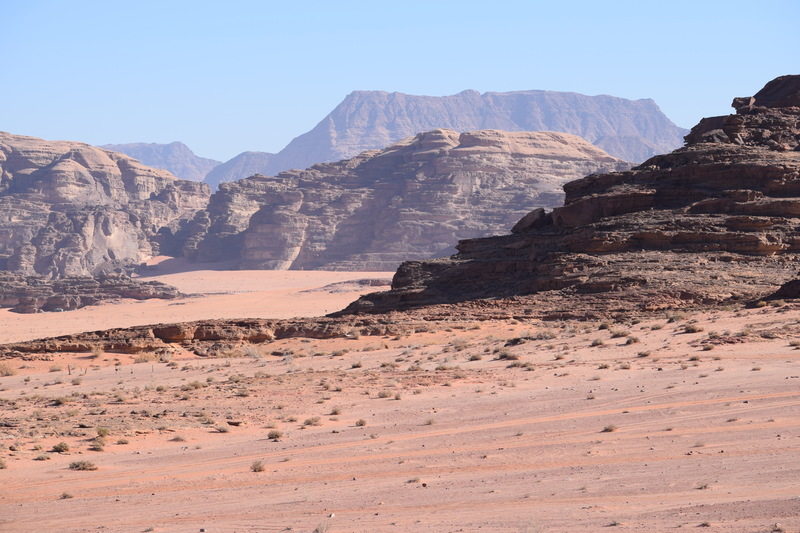 Paul’s time in Arabia (Gal 1:17) possibly brought him as far south as Petra. According to 2 Corinthians 11:32-33, an official in Damascus under the Nabbatean king Aretas IV, who reigned from 9 BCE to 40 CE, was seeking to arrest Paul, but Paul was secretly lowered over the town wall in a basket and escaped. Aretas IV’s daughter had married Herod Antipas, but Antipas divorced her in favor of Herodias, his brother Philip’s wife. This led to the beheading of John the Baptist, who had condemned the union (Matt 14:1-12; Mark 6:14-29; Luke 9:7-9. According to the ancient Jewish historian Josephus (Jewish Antiquities 18.116-19), John’s was executed at Herod’s fortress Machaerus in Jordan. Madaba (or Medeba) is about 20 miles south of Amman. It is mentioned in the narrative of the conquest of Moab (Num 21:30; Josh 13:9, 16) and in the times of David’s war with the Ammonites (1 Chron 19:7). It also figures in the history of the intertestamental period (e.g. 1 Macc 9:35-42). 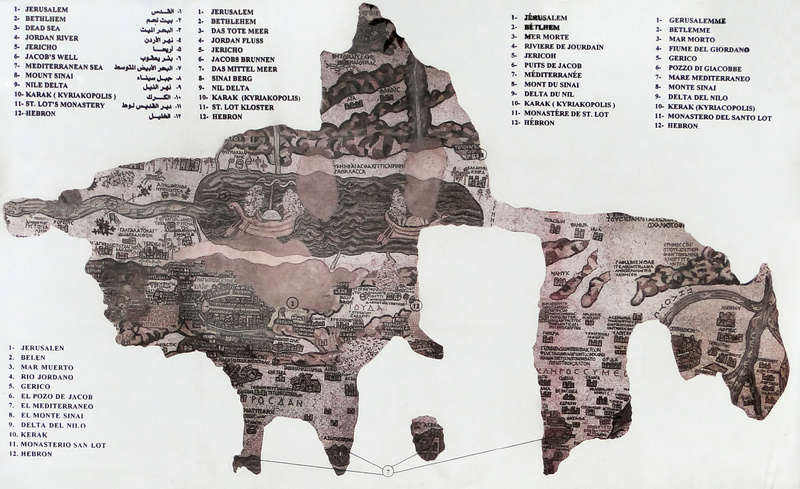 The Madaba map is the oldest map of Palestine in existence, dating from ca. 550 CE. 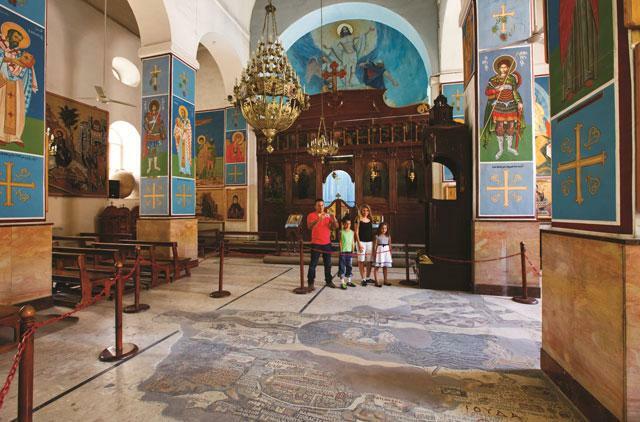 It is a mosaic, part of the floor of St George’s Church, originally roughly eighteen by 50 feet in size, portraying Palestine and Jordan from Syria to Egypt. But as the picture above shows, the map was badly damaged through the years and is only partially preserved today. 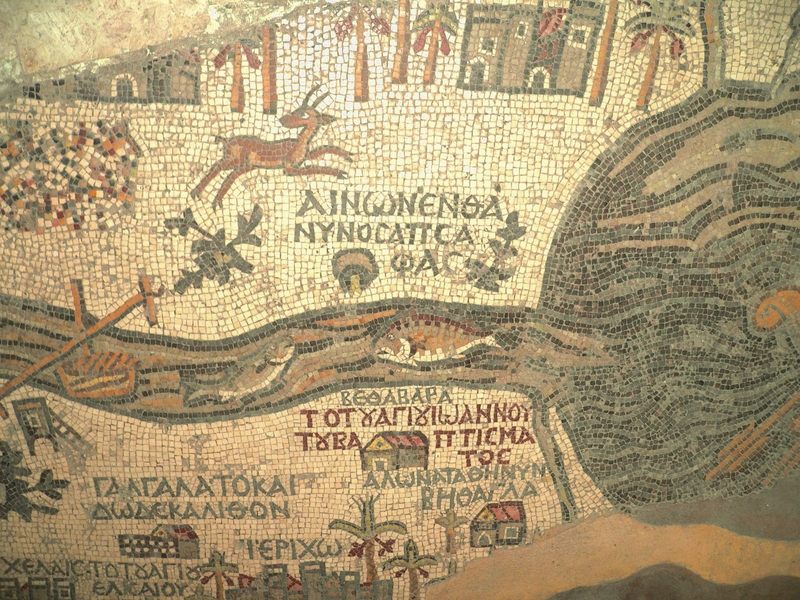 The significance of the Madaba map lies in its location of biblical sites, such as the place of John’s baptism in the picture above. Altogether about 150 places from both the Old and New Testaments are named on the map. 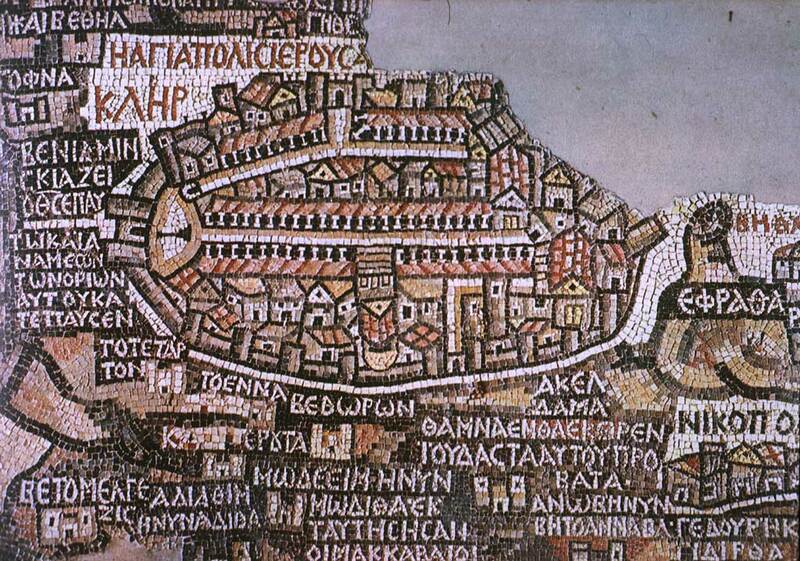 The map’s portrayal of Jerusalem is particularly detailed and interesting. The Romans had changed the name of Jerusalem to Aelia Capitolina and reconstructed the city following the Bar Kochba Revolt (132-136 CE). Accordingly, the map shows the central Roman cardo running south from the Damascus Gate through the city, but the name remains “Holy City Jerusalem” (the Word Jerusalem is incomplete). The Church of the Holy Sepulcher is also prominently featured. 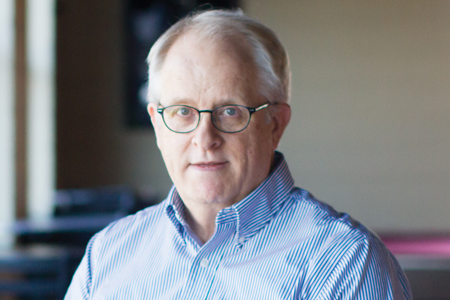 Want to learn more about Jordan and the Bible? So much more could be said about Jordan’s prominent role in the Bible, but this post is already too long. 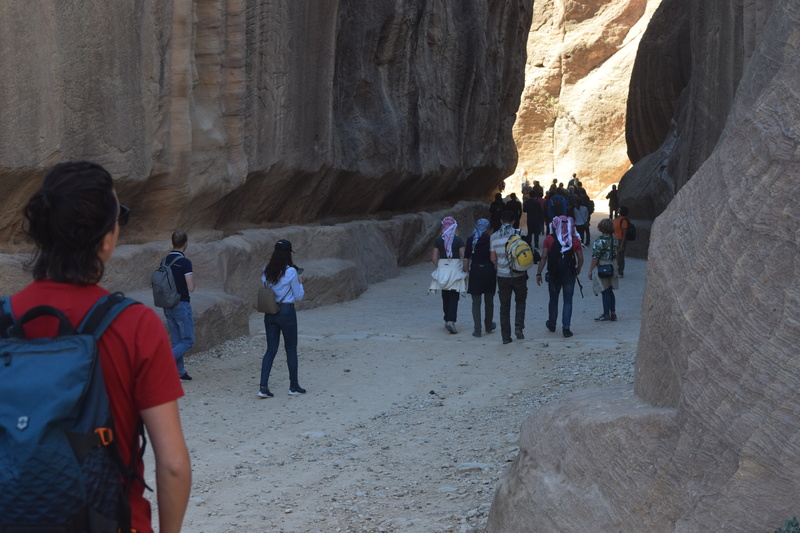 Edward Dawson’s Travel through Jordan emphasizes archaeology and biblical history. E Borgia’s Jordan: Past and Present focuses on Amman, Petra, and Jerash. For additional sites traditionally tied to biblical events, see this ebook provided by the Jordan Tourism Board. Our next post in this series will focus on the Arabah and the western side of the Dead Sea, featuring Masada, En Gedi, and Qumran. I brought your people out of Egypt . . . You saw with your own eyes what I did to the Egyptians. Then you lived in the wilderness for a long time. I brought you to the land of the Amorites who lived east of the Jordan. They fought against you, but I gave them into your hands . . .
Then you crossed the Jordan and came to Jericho. The citizens of Jericho fought against you, . . . but I gave them into your hands. Thanks Bill (and Jerry and Bob)! Enjoyed reading the post and viewing the pictures. Looking forward to the next post. Very full of good information, I hope to retain a fraction of it. Makes me want to visit Jordan myself. Well, what’s stopping you? Go for it! Thanks for inviting me to join you on this trip. It was a wonderful experience and enhanced my knowledge of the region from my prior trip. There was information overload each day and memories to last for a lifetime! Beverly and I really enjoyed it Jim. Thanks for the 5 a.m. interpretive tour of the Holy Sepulchre. They had a wonderful article in the Smithsonian magazine on Petra. Thanks Leslie, it it’s online, send me the link and I’ll post it. I heard something on the radio a month or so ago that a part of the Dead Sea is coming back to life, as prophesied in the Bible. Did you hear anything about this in the course of your travels?